I went to see Brave last Monday (not this Monday, but the Monday before). I will put in my disclaimer: I shed a tear at the end. In my defense, it was a really good movie. Okay, first thoughts: The commercials were totally misleading! Snow White and the Huntsman Trailer | boxofficeBUZ.com. My dear, dear Snow White. So because I feel that it is my duty to my readers to bring fresh content to my blog, *cough cough* I am going out of my way to see and review this movie for you all. Charlize Theron is in it and she so makes up for Kristen Stewart. The huntsman is Chris Hemsworth aka Thor. And I can vouch for his hotness…I mean, I’m not the only who’s seen Thor, right? I love dark, gritty fantasy movies. Some of my recent favorites include KickAss and Suckerpunch. I definitely appreciate Disney movie remakes, whether in film or book format. I’m semi-obsessed with Snow White right now since “Once Upon a Time” is on ABC on Sundays at 8pm (had to plug that in…post to come about that little gem!). And finally, in the previews, Kristen Stewart doesn’t speak. I’m taking that as a sign that the producers are aware of her weaknesses and are planning accordingly. Summer is a long time to wait for a movie, but this looks like it will be worth it. We shall see, people…we shall see. Click on the picture or link above for the trailer! 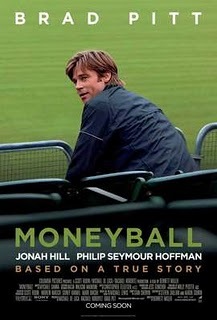 I went to see Moneyball last Friday with my cousin. First impression, Brad Pitt and Jonah Hill work well together.